In celebration of upcoming Valentine’s Day, we are excited to release Lucie Bennett’s The Sleeping Lovers, a new limited edition print which explores the kind of comfort and closeness only found with true intimacy. This new work is characteristically Bennett - full of emotion, and expressed through remarkably fluid hand-drawn lines. Here, Bennett depicts an extremely personal moment between two lovers as they embrace each other tenderly in their sleep. The framing and composition of Bennett’s image brings viewers as close as possible to the two resting figures. Their hair and faces are intertwined and there is the hint of a shoulder wrapping around, emphasising the closeness of the lovers to each-other, as well as to the viewer. We feel right in the moment with them. In this work we see a natural continuation from themes explored in ‘The Embrace’ - both artworks representing a shift in focus to dreamier, more intimate portraits. Once again we see the male figure in The Sleeping Lovers take the primary place in the composition, his face gently obscuring that of the female nuzzled into his hair. The Sleeping Lovers, as with all of Bennett’s screen-prints, was originally conceived through painstakingly careful drawing. Each line was meticulously formed with a brush so as to create a feeling of one fluid motion, and the illusion of effortlessness we so closely associate with Bennett’s style. In the final print, varnish has been carefully applied to the line-work, forming a beautifully soft shimmer on the surface of the paper, reflecting light and creating a distinct sense of movement. 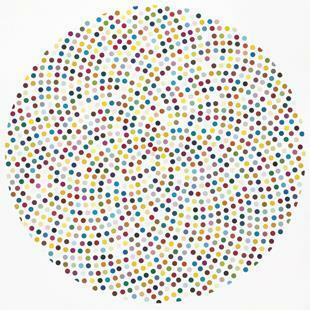 Bennett’s technique sets her apart from many screen-print artists, who often use computer-drawn images. Instead, here we can appreciate Bennett’s true craftsmanship, revealing the artist’s hand at work. 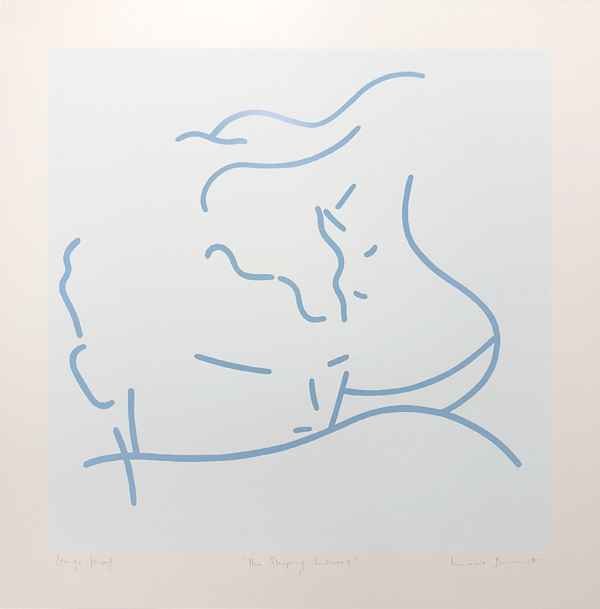 While in many ways The Sleeping Lovers is similar to The Embrace, notably, in this new print edition we see Bennett take a more purposeful step towards abstraction. Breaking down her image to the simplest representation of form, the curves of the lovers’ features - their faces, eyes, hair and shoulders - seem to almost merge as one. Perhaps at first glance the two faces may be almost imperceptible - appearing instead as abstract interlocking lines, moving and curving over the paper. However, as the viewer’s eyes focus, the intended image slowly starts to reveal itself. Bennett describes this work as wanting to push the imagery towards the abstract realm. The ultra-simplicity of this new work represents the direction which Bennett’s latest paintings have been taking - particularly influenced by Manga and Anime imagery. The interpretation of ‘Manga’, which means ‘whimsical’ (man) ‘pictures’ (ga) seems a well-matched description for Bennett’s works, which often tiptoe on the edge of fantasy in their illusive simplicity, yet are also full of emotion and story-telling. With today’s revived interest in Manga which sees a new cinematic release from James Cameron (Alita: Battle Angel) based on a Manga story; and the opening of a major new exhibition titled Manga at the British Museum this May, Bennett is certainly not alone in her interest in this fascinating Japanese art form, and it therefore seems timely that she should manifest this influence in her latest work. The new print edition, The Sleeping Lovers, is a small edition of 15 and available from £1950.00. You can find all available work by Lucie Bennett on her artist page here. The new print edition by contemporary artist Lucie Bennett represents a continuation of the artist’s recent focus on more intimate portrayals of her figures alongside a softer colour palette.